The Life Fitness Platinum Club Series Recumbent Cycle allows you to go interactive with your home workout experience. Fitted with a club-quality Discover SI LCD touch-screen; you have access to extensive entertainment options; enhanced interaction; internet connectivity and much more. Built for comfort; the Platinum Recumbent Cycle provides a solid platform for intensive training. It comes fitted with a Comfort Curve seat with deluxe back rest for exceptional comfort and support. Height adjustable; the precisely angled seat ensures correct lower body positioning for added comfort and reduced pressure on knees. An extensive 26 resistance levels provide enough intensity to challenge all fitness levels and can be changed with ease using the at-your-fingertips resistance controls in the handlebars. The bike is fitted with the cutting edge Discover SI console. Featuring Swipe Technology; you can navigate around the 10 LCD touch screen to choose your workouts and entertainment with ease. With internet connectivity and Apple and Android compatibility; you can manage playlists; watch videos and use the LFopen platform to use Life Fitness compatible apps. 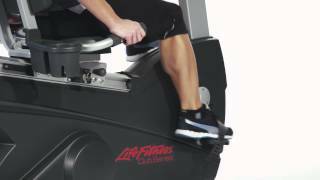 The Discover SI console is packed with stimulating workout options. There are extensive built in programmes including classic; Healthy Heart; Goal and Performance programmes; as well as Bike and Constant Calories Per Hour Modes. You also have access to Lifescape interactive courses which allow you to take high definition hikes though famous world-wide locations. With access to the LFConnect website and app; you can personalise your workout settings; personalise your home screen with photos and messages; track your workouts and more. Lifepulse digital heart rate monitoring hand sensors are conveniently placed in the side handlebars. Polar telemetry (chest strap included) provides accurate; hands-free heart rate monitoring. 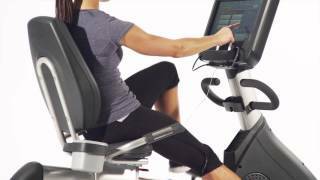 The Life Fitness Platinum Club Series Recumbent Cycle with Discover SI Console comes in Arctic Silver. Other colours available include: Titanium Storm; Blank Onyx and Diamond White.